This is to list the set of web 2.0 tools that I am using to plan and track my vacation. We are using Google Spreadsheets to consolidate all the data that we are getting from the web. This is really useful when multiple people are simultaneously gathering data (my brother and sister-in-law who are currently in Belgium are also actively involved). 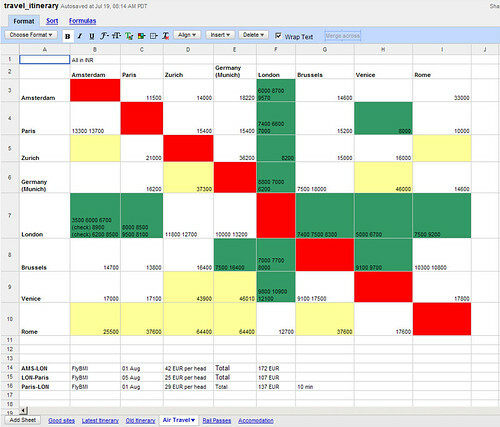 With this tool, I can share my spreadsheet with multiple people and all of us can simultaneously edit the contents. This also helps in keeping the data always in sync. 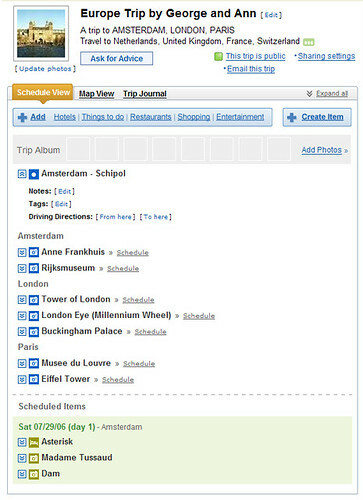 Yahoo trip planner helps in trashing out the next level of details in the trip schedule. The process starts by specifying the start and end date of the trip. Once this is doe, we can start to add meat to the schedule. Helps you decide on what to do at different locations, by giving a list of things to choose from (with user reviews/ratings). Also integrates with Flickr. So if you have uploaded some photos, this tool helps you associate different photo with different locations. Helps in creating a trip journal. I have just started my planning here. Again, this tool helps in keeping the plans made by all of us in sync. Though Yahoo trip will help you create an agenda for the vacation, if we need more fine grained detail, we need a real calender. That is where Google calendar comes in. Google also lets you publish this calendar where ever you want. And of course, multiple people can simultaneously add to the calender. I have published our calender at my site here.